True believers in searching for extraterrestrial intelligence out there in the nothing much are becoming more desperate, even silly. They are basing their assumptions on atoms-to-alien evolution and the foolish notion that either God does not exist, or he does not mean what he told us in his written Word. However, these ETI seekers are building on foundations that should appear to be fundamentally flawed even to them — if they bothered to cognate on it for a spell. There is an increasing amount of evidence that stars are nowhere near as well-behaved as our own sun, emitting powerful solar flares that would be killing of living things on their planets. The most plentiful stars, red dwarfs, are sneezy and grumpy. Blue ones can also be obstreperous. Earth was created to be inhabited, and that's a natural fact. You don’t want to enter a HAZMAT zone. That’s where toxic materials pose a danger to life or the environment. 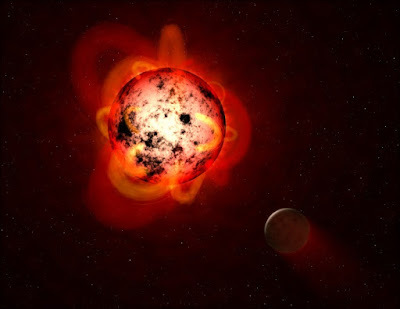 NASA took on this word for a program called HAZMAT, standing for “Habitable Zones and M dwarf Activity across Time.” An article for NASA Exoplanet Exploration announces one of the first findings from HAZMAT: “Superflares from young red dwarf stars imperil planets.” That’s because their parent stars, the most numerous in the universe (M-dwarf stars), are nasty. To read the rest, click on "NASA Verdict: Most Exoplanets Are Not Habitable". Altruism in Different Kinds of Animals?